Note: for details of the Ju 88, see Air War Italy 1944-45 (page 40); for the Me 110, click here. 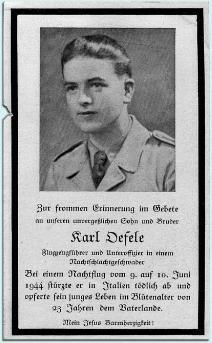 Since I wrote the book, Oefele's memorial cards have appeared online a number of times. Typewritten Luftwaffe loss records confirm that his name did begin with an "O", despite how might look in the »Fraktur« typeface. (Thanks to Matti Salonen for his input on this). Originally interred in the Cimiterio Generale at Torino, Karl Oefele was later reburied in the German military cemetery, Costermano.